Hi Fit2Fiters, it has been longer than expected for an update but be under no illusion the F2F Team have been busy beavering away. F2F held its first course in the North East at the fantastic Hartlepool Wadokai Centre. Thanks to Gavin and Amy for making Greg so welcome even though the weather conditions were ridiculously bad. Congrats to Amy, Rebecca, Gavin, Liam and Steve for passing the Instructors course and look forward to seeing F2F move onward and upward. March also saw Greg jet off to Savannah, Georgia, United States for the first International Corporate FIT2FITE class. Greg’s long term friend Dave Ritchie a Shukokai 4th Dan now works in America and was keen to introduce his company to the F2F concept. Thanks to Dave for coordinating this tremendous opportunity for F2F . Greg and his family attended the Medal Ceremony for his British Empire Medal at the Tower of London. The Lord Lieutenant presented Greg with is medal in from of a number of other worthy winners and commented on Greg’s citation. Greg said, “Fantastic day for me the family, my community and all those who know me”. Also look out for classes from Amy Jorgenson in Hartlepool and Liam Conroy in Newcastle coming soon. Sian Scott, Master F2F Instructor for New Zealand and member of the NZ Karate squad is now teaching jam packed classes at Auckland University . 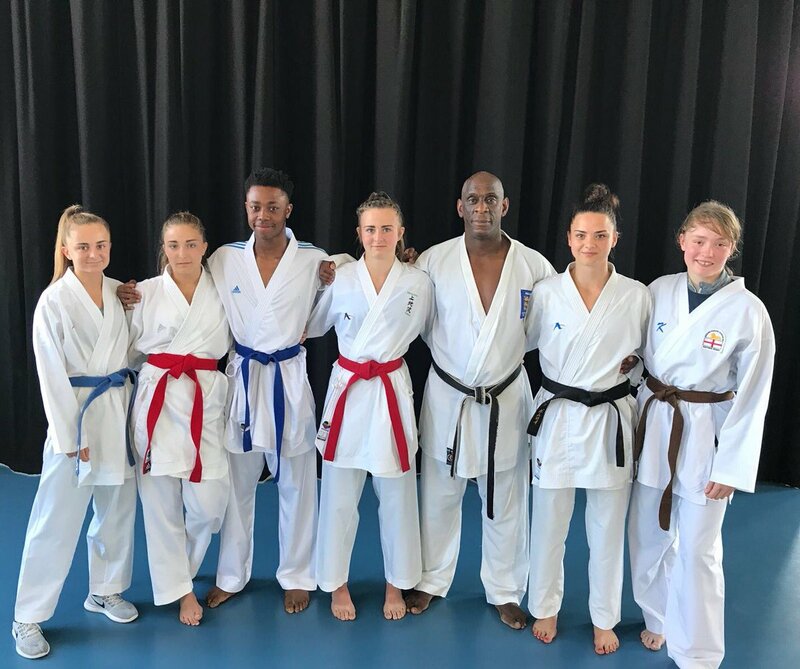 Sian through her Karate Association has carved out a niche profile for F2F in New Zealand and is looking to open more classes and identify instructors to join her on her F2F pathway. 18th April saw another FIT2FITE Instructor course at Becontree Heath Leisure Centre. This was a real family affair with Greg’s brother, avid F2F enthusiast Joe qualifying alongside his “pin up” nephew Edward Newark. Well done also to Pawel, Shannan and Corin for their excellent application and focus. Special congrats to Melissa Lewis-brown and Princess Fallon Karadjordevic both upgraded to Silver Level. Thanks to Claire Burton and Ross Mathieu for conducting FIT2FITE classes at the 3NESS Luxury Weekender in February and the FITFEVER holiday in Fuertueventura. On the subject of Ross we wish him a speedy recovery after snapping his Achilles tendon. Also thanks to the F2F Instructors, Claire, Greg, Natalie and Pam who have been covering in his absence. That is a real F2F family unit coming together to help each other out. 27th May saw the second FIT2FITE Bronze level grading. 11 FIT2FITER’s from Collier Row and Barking were put through the FIT2FITE Four Step Format . Focus was on the Fundamentals of fitness, Strength, Stamina and Suppleness and the component parts of F2F used as measures: Timing, Tension, Target, Technique and Intensity. Although well prepared with a syllabus and online tutorials for reference it was clear that the group were all nervous or as Greg would say 2shaking like Elvis”.. 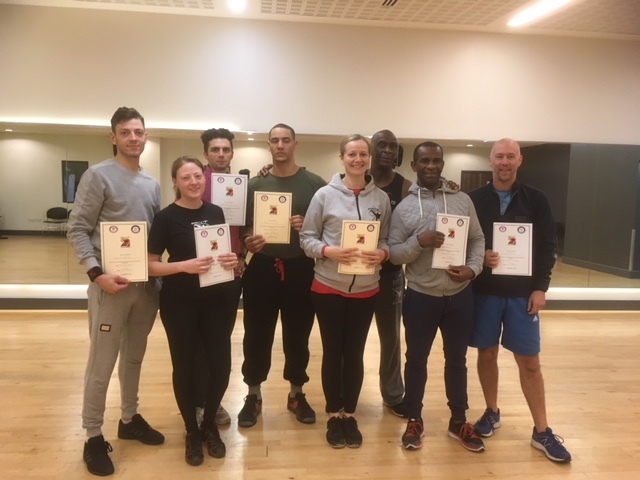 They need not worry the group all passed with flying colours and were certified Bronze level by Greg and Sara Hawkins the Chief grading Instructors. Next grading is in October 2018,. Keep a look out for more information. 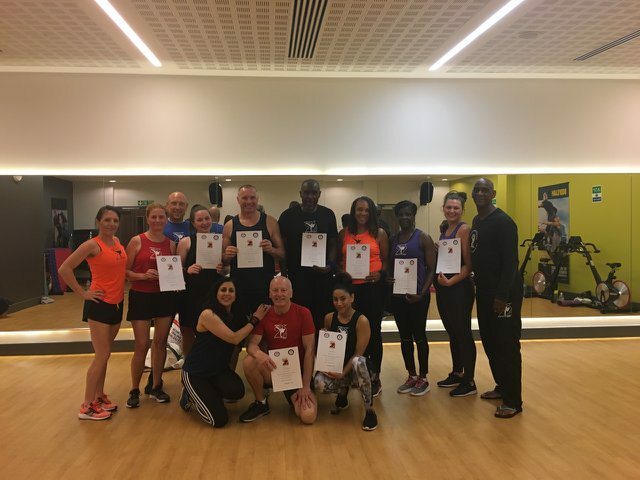 F2F Founder Greg Francis held a series of FIT2FITE Bronze level masterclasses at Forest Gate Community School on May 8th and 29th. 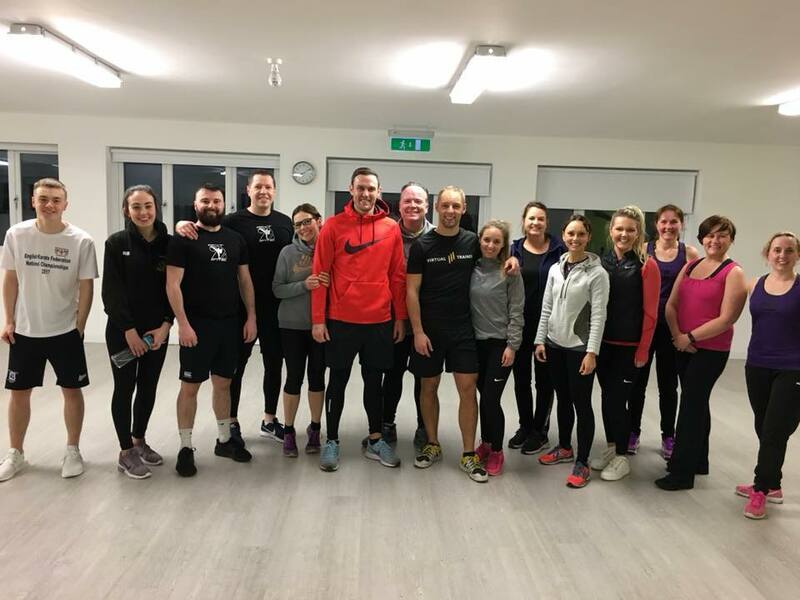 This venue hosts Ross Mathieu’s class and they were there in numbers with over 50 people bathing in the F2F experience from Braintree, Barking and Collier Row F2F classes alongside Forest Gate’s finest.. The event was so popular Greg will be holding another Bronze masterclass in June. Look out for the date. Must mention the exquisite sound system. It was an absolute delight. Well done to Ross for a great venue and tremendous event. Get well soon! “this event is unquestionably one of the best karate Courses on the globe bringing experience and insight from top Karate and fitness professionals. It is an honour to be part of it”..
Greg with the Worlds best ever Karate fighter, Sensei Wayne Otto plus Former World Champions Elisa Au, USA and Alex Biamonti, France. 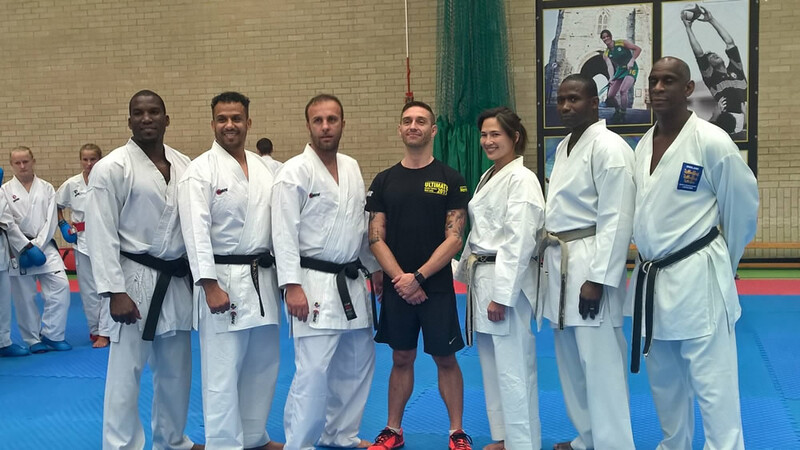 In closing Greg trains a small group of elite International Karate Athletes/Fit2fiters and has managed to secure for them sponsorship from the “Everyone Active” Sports Corporation. Amongst the benefits they receive is free access to over 155 sites UK wide. Well done Greg and good luck to his crew and especially to those training for selection for the Youth and Tokyo Olympics. That’s all from us from now. Next update scheduled for July/August.